Sign up for Online Game updates! 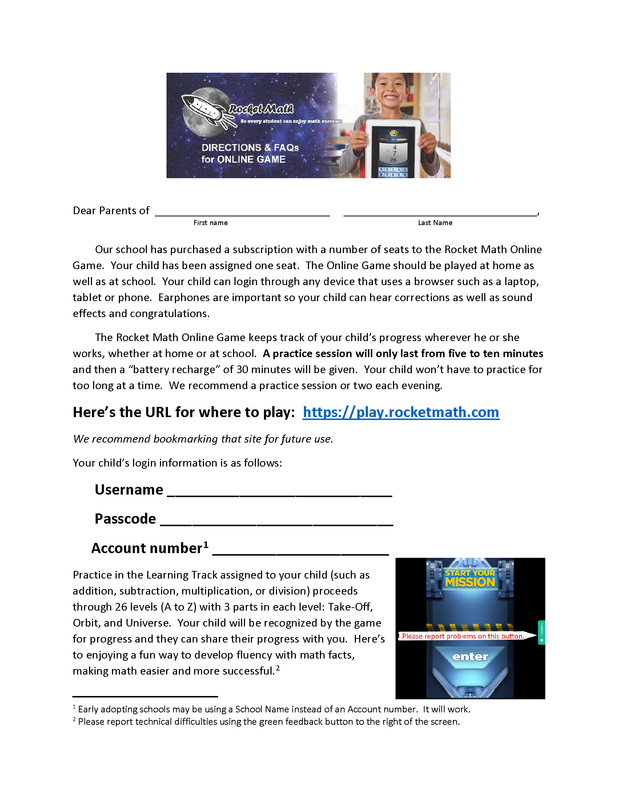 Get news about Rocket Math Online Game in your inbox. 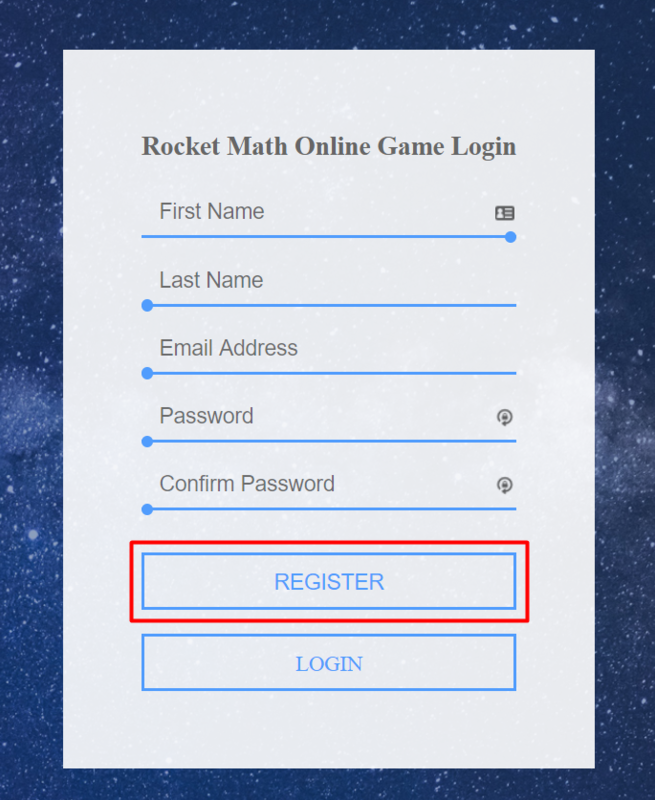 Get the answers to all your Rocket Math Online Game questions here. No charge for the 30 day free trial (no gotcha’s). When the free trial is over, to continue you’ll have to go into your account and set up the next subscription. Here’s information (that may not be apparent) about how to set up the free trial for an Online Game subscription. 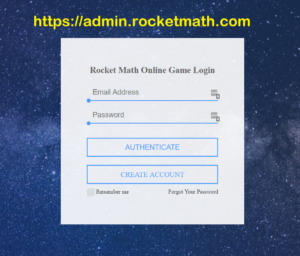 First I am assuming you already registered your name and email address at https://admin.rocketmath.com for a free account at the Rocket Math Online Game. If you haven’t do that now. You then had to verify your email address, by clicking a link on an email we send to you. The next step is to to set up the seats and assign the logins for your No risk 30 day trial. You should have been given a chance to set up seats in the free trial as soon as you registered, which takes you directly to Step 2 below. If not, go to Step 1. You should see the pop-up below. Step 2. Welcome to free trial page–Set up seats and assign logins. 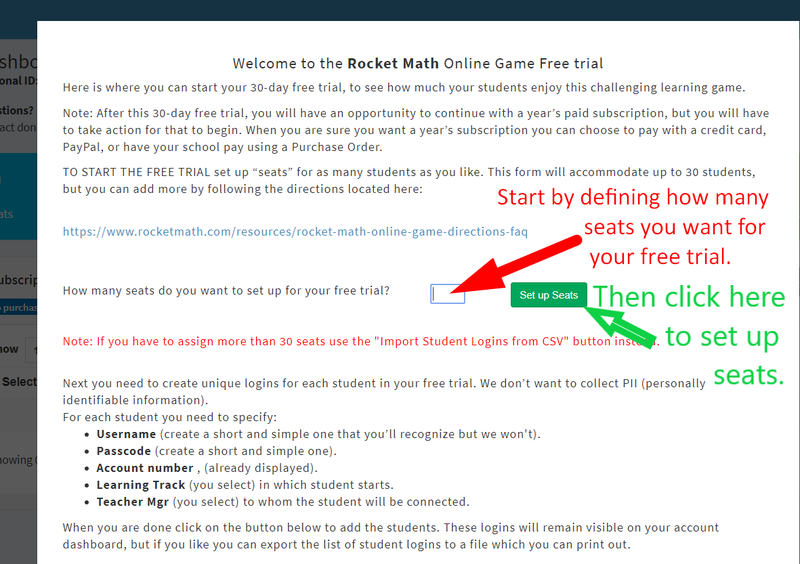 Welcome to the Rocket Math Online Game Free Trial. When you come back to your dashboard this dialog box will pop up. Here’s where you can start your 30-day free trial. Start by defining how many seats you want to set up for your free trial. You can set up as many as you wish, 1 seat or 500 seats, your choice, we want you to be sure. Then click the green Set Up Seats button to open up that number of seats. Next enter the login information for the seats. Create logins for up to 30 seats, with usernames and passcodes you make up. Keep ’em simple!! But remember, we have promised not to collect any PII (Personally Identifiable Information) on your students, so to be confidential make up usernames that helps you as their teacher to know who is who, but does not reveal their personal identity to an outsider. 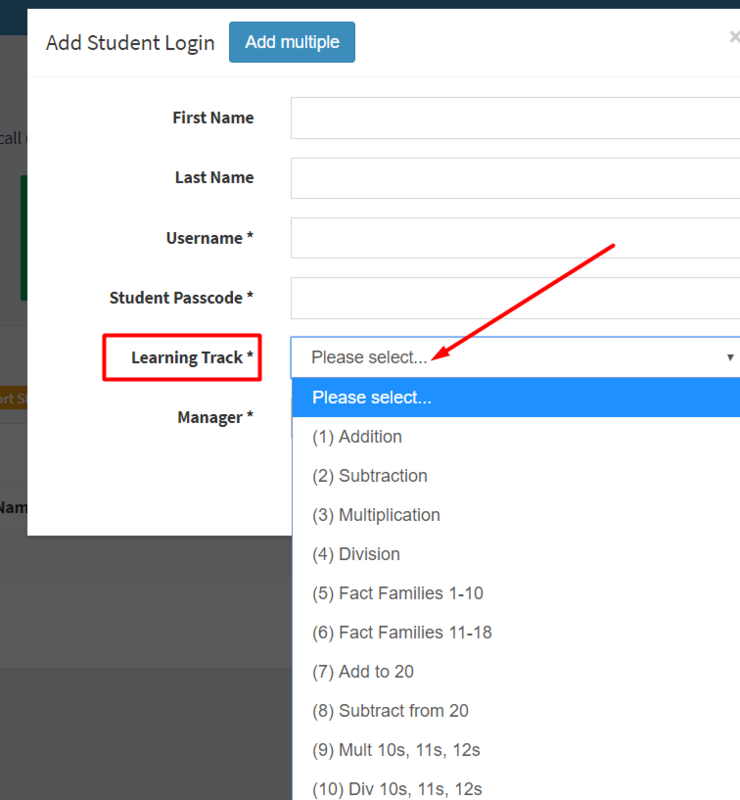 For each student select the Learning Track and Teacher Mgr. Click here to find out more about Learning Tracks. Click here to learn more about how to add more Teacher Mgrs. That’s it! 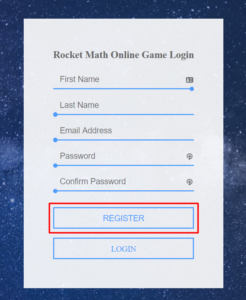 Your students can now go to https://play.rocketmath.com and use their logins to begin playing the game. There will be no charges but it will expire in 30 days. (We will save the student progress.) To continue the subscription you will have to go into your account and set up the next subscription. No gotcha’s on the free trial. It just ends unless you take action. If your current subscription is the free trial, it lasts for 30 days and then expires. If you do not choose to start a”next” subscription that will be all there is to it. Step 1. Enter the number of seats you want to have. You don’t have to stick with the number you had in your free trial. Pricing is shown above, but is fairly simple. One to 19 seats cost $3.89 each per year. Note you can play with different amounts in the “number of seats field” and it will show you the price. Step 2. Choose the start date. Decide when you want the next subscription to start–upon expiration of your current subscription or immediately, like today. Normally, you’ll want your next subscription to begin when the current one ends. If you want to change your subscription see below. Step 3. Choose your payment method. PayPal–you’re welcome to use this if you have such an account. If you use Pay Pal you are familiar with how it works. 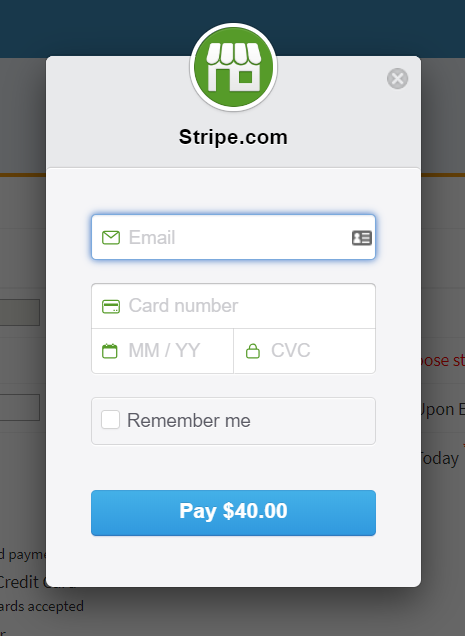 Credit cards–this operates through Stripe. It will ask for the email of your account–so we can credit the payment to the right account. Then it will ask you for your credit card number and verification info. You will be charged as soon as it goes through. 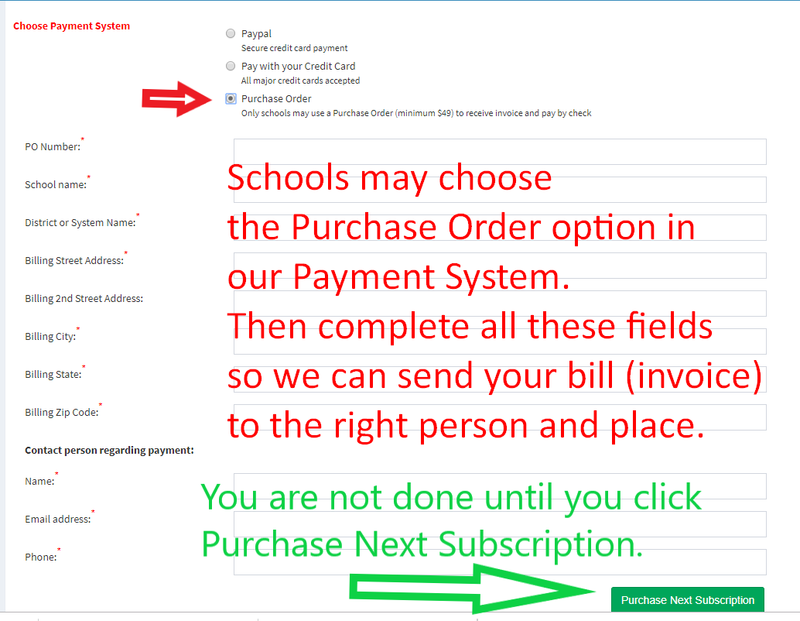 Purchase orders–only schools are allowed to use Purchase Orders and there is a minimum order of $49. When you choose this option, the purchase order fields open up. All the fields in the PO section need to be completed (except the 2nd Street Address) in order for this to go through. We take that information and create an invoice in QuickBooks which we send to the person you say should get it. The invoice is due in 30 days. You’re on your honor–putting in a PO number means you are promising that such a PO has been approved and for the amount you are incurring. We can create quotes for you, if you need one to get a PO approved. Just let us know. If you want to change the number of seats in your subscription the only way to do that is to create a new “next” subscription with that number of seats, and you’ll want it to begin today. If you start your new subscription today (before the current subscription ends), you’ll be given a credit for the unused portion of your previous subscription and charged for the next subscription at the usual rate. Please, don’t do that lightly, as the refunds and up-charges get pretty complicated, but you’re welcome to make that change. Also note that you don’t want to have fewer seats than you have assigned with student logins. Please erase the logins of any students who won’t be on the new subscription. 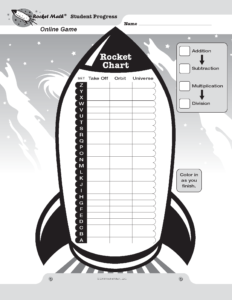 In the Rocket Math Online Game every student needs to be started in one of the ten Learning Tracks. A student’s Learning Track can bechanged at any time**, but one must be chosen to begin with. If you are entering the Student Login using the csv method of entry you’ll need to enter a number for the track. The ten learning tracks are numbered as follows. 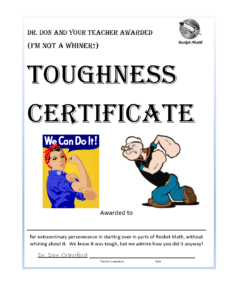 You can click this link to see a google document showing all the problems learned in each of the Learning Tracks. Click to see the problems in the tracks. 4th grade and above: Multiplication then Division, and then going back to get Addition and Subtraction if those haven’t been learned. Another way to learn basic Addition and Subtraction Facts. Learning in Fact Families is another order to learn. 1st grade: Fact Families (1 to 10) adding and subtracting. 2nd grade: Fact Families (11 to 18) adding and subtracting. 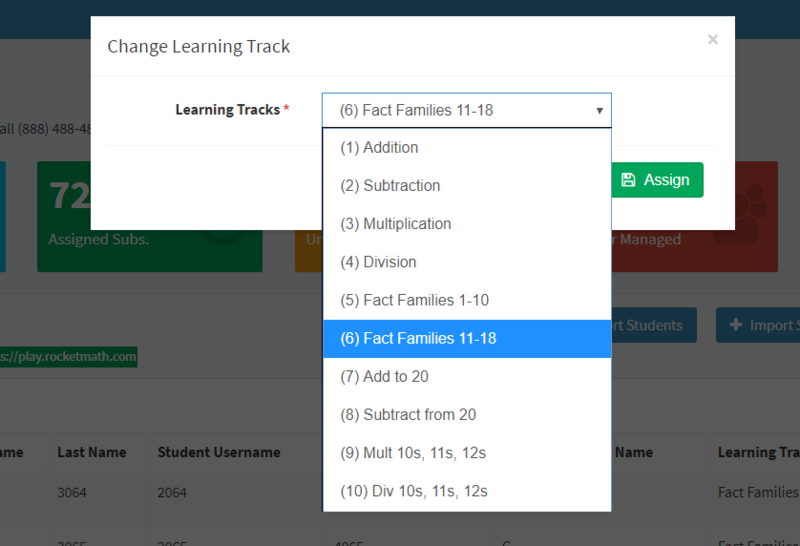 You can choose Fact Families instead of the basic addition and basic subtraction fact Learning Tracks. 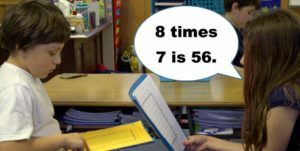 Optionally, Fact Families is also a good way to review for students who have already learned the basic addition and subtraction facts in first or second grade. 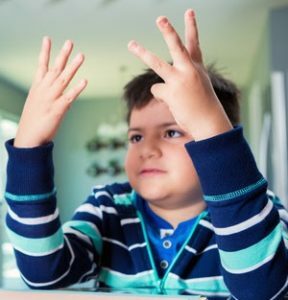 Make sure your students have worked through the expected basic operations for their grade level BEFORE doing any of the optional Learning Tracks. If you have 30 or fewer seats, you can simply assign login information to seats in this pop-up. If you weren’t automatically directed here, in your dashboard click on the blue button that says + Assign Student Logins. PLEASE NOTE: We do not want to collect personally identifiable student information, so you see there’s no place for the student’s name. Be sure your usernames help you remember who goes with which username. You do need to know that, but we don’t! Thanks. Note that your Account number is already filled in. Your students will enter that as they login. Then be sure to select one of the ten Learning Track from the pull-down menu (see it in the picture). 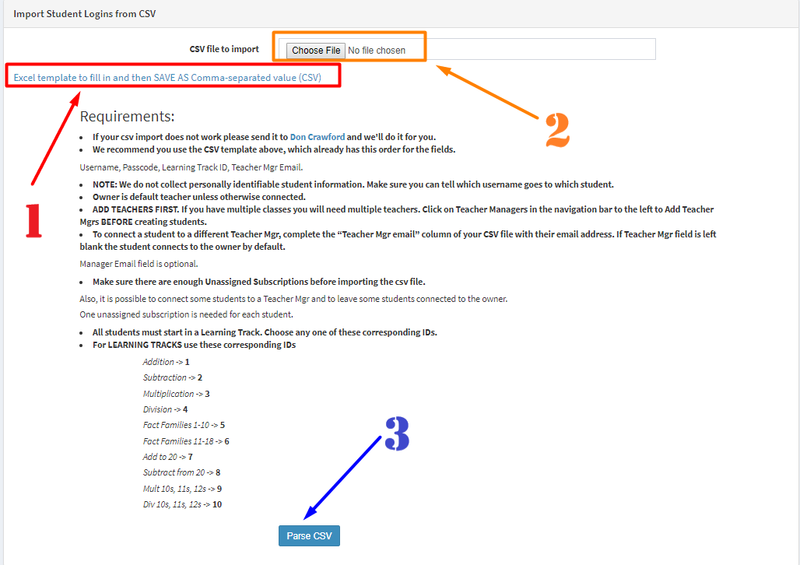 If you need help choosing a Learning Track, you can go to this section in the directions about the Learning Tracks for help deciding where to start. If you are the owner, you are also the first teacher and you’ll be able to see the progress of all the students. (If you have more than yourself as a teacher, you can select other names as Teacher Mgr.) 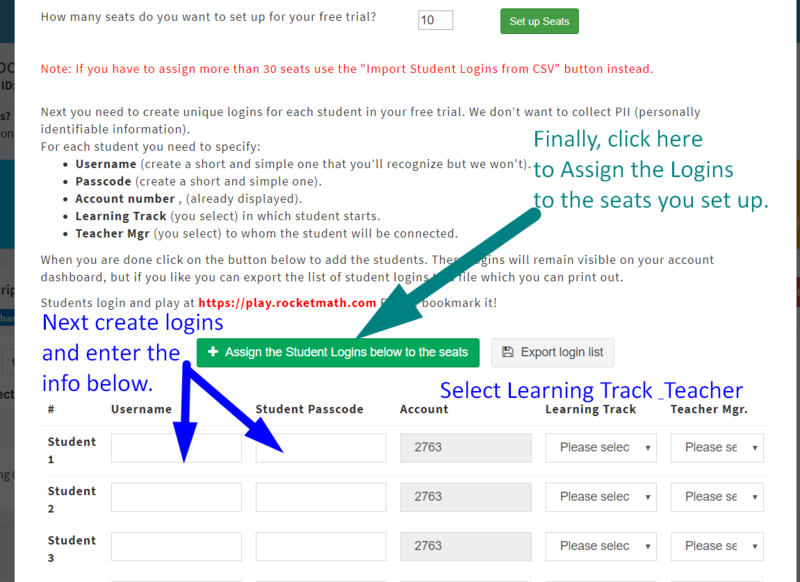 After you hit the green button + Assign the Student Logins below to the seats then your students are ready to play. Export login list. 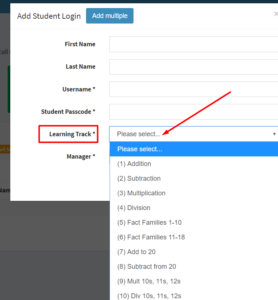 To help you keep track of the logins you’ve created you can click on the gray box (next to the green Assign the student logins…” that says, “Export login list.” That will give you the list of the logins you just created. 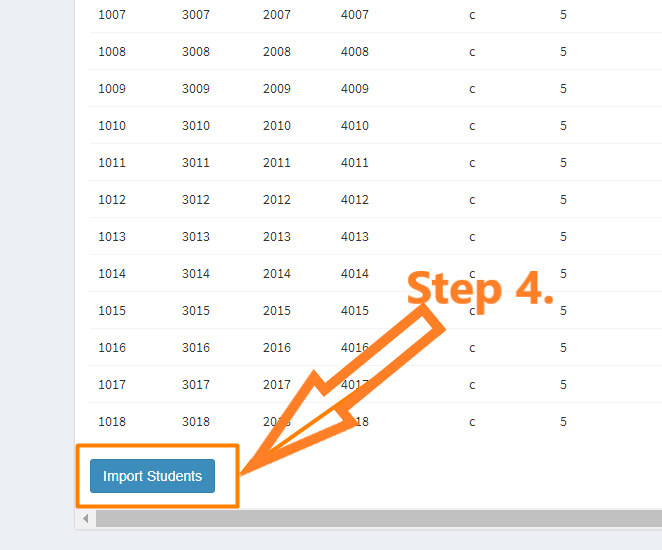 Better yet, if you want a COMPLETE list, go back to your dashboard and click on the “Export Students” button. That will give you all the logins you have created for your account. That has the advantage of having an empty column entitled “Student Name” where you can type in their names to keep a copy for your own records. We don’t record that information on our website, but you’re welcome to save a copy for yourself. **BE KIND. Your child has to enter the username, passcode and Account number every time they login to play. So be kind and make these short, easy to remember, and easy to type in. Initials or nicknames for username, a short word or 3 or 4 digits for a passcode would work great. The owner is automatically the first teacher. 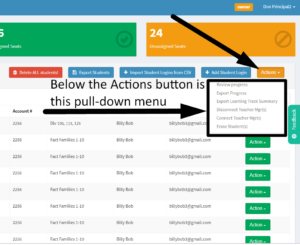 The owner will always be able to see ALL the students in the dashboard and can review everyone’s progress. If you need help, as owner you can set up additional people as Teacher Mgrs to help manage the seats. Note: You need to set up your Teacher Mgrs before you input the students, but you can add more Teacher Mgrs at any time with these same directions. Go to the Teacher Manager page by clicking on the Teacher Managers link in the left hand navigation. 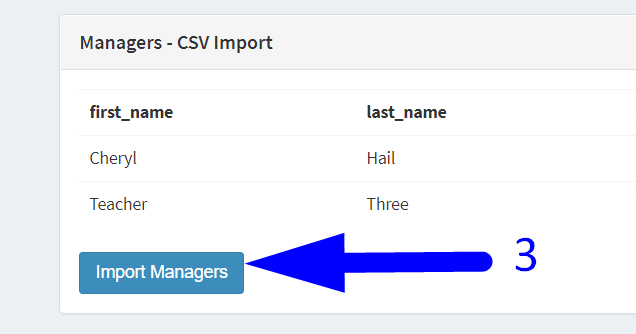 There are two ways to add Teacher Mgrs to your account, either individually if you only need to add a handful, or with a CSV import if you have more than a handful. One way: Add Teacher Mgrs Individually. On the Teacher Mgr page, click the blue Add Teacher Mgr button in the upper right. When you hit the green “Create” button the system will create a password for that teacher and send it to the email you entered for them. 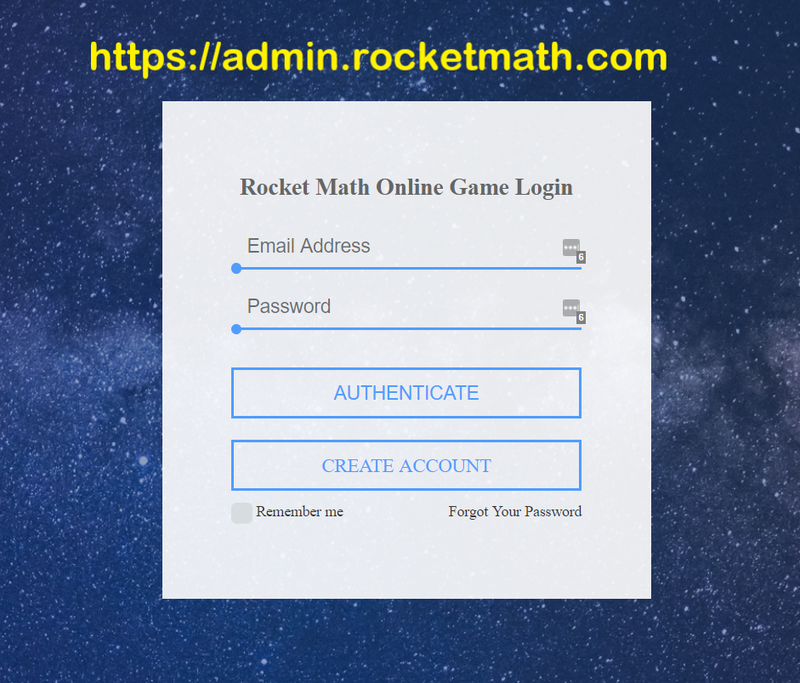 It’s a hard password, so they will want to go to the https://admin.rocketmath.com page to change it. Second way: Import Teacher Mgrs with a CSV file. 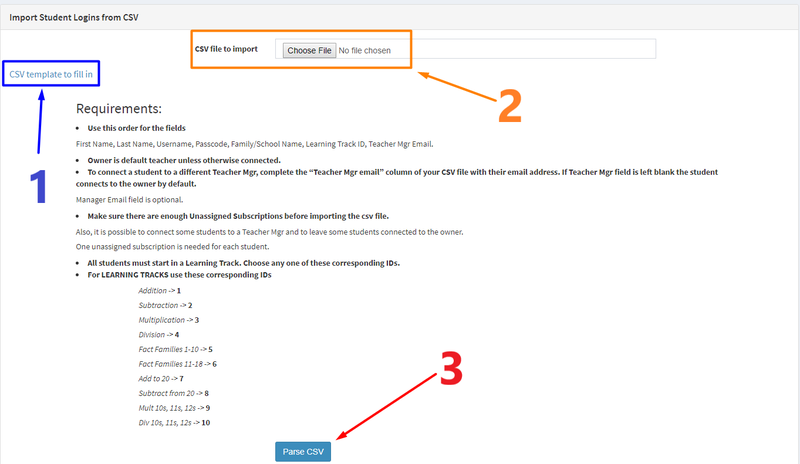 If you have more than a handful of teachers, you’ll want to use the CSV file method. Click on the blue button that says “+Import teachers from CSV.” Open the template that is provided in blue print “Excel template to fill in and then SAVE AS Comma-separated value (CSV)” See what it looks like to the right. 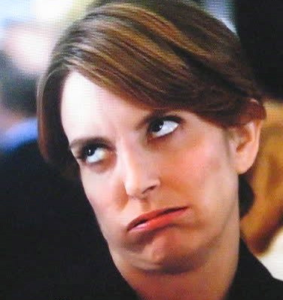 You just enter each teacher manager’s first and last name, their email address and a password. (Keep track of the password because you have to tell them what it is!) After you fill out this information save the file, but use SAVE AS and choose CSV (Comma delimited) as the file format. See what that looks like to the left. 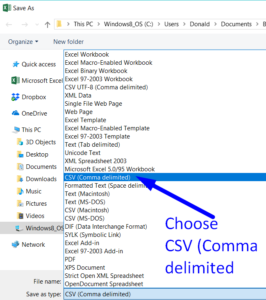 If you don’t choose SAVE AS and select CSV (Comma delimited) then your file won’t import. After saving the file as a CSV, you have three steps. 1) In the pop-up for importing Teacher Mgrs click on Choose File at the top. Go and find the file you just saved in the CSV format. 2) Click on the blue button at the bottom that says Parse CSV. 3) Another pop-up will appear with the Teacher Mgrs info on it. Go to the bottom and see another blue button which says “Import Managers” Click on it to finish importing your teacher managers. Send an email to your teachers with their password. Tell them where to logon at https://admin.rocketmath.com . Don’t wait too long to let your teachers know about the incoming information or they’ll miss the email and then they won’t know how to enter the system. 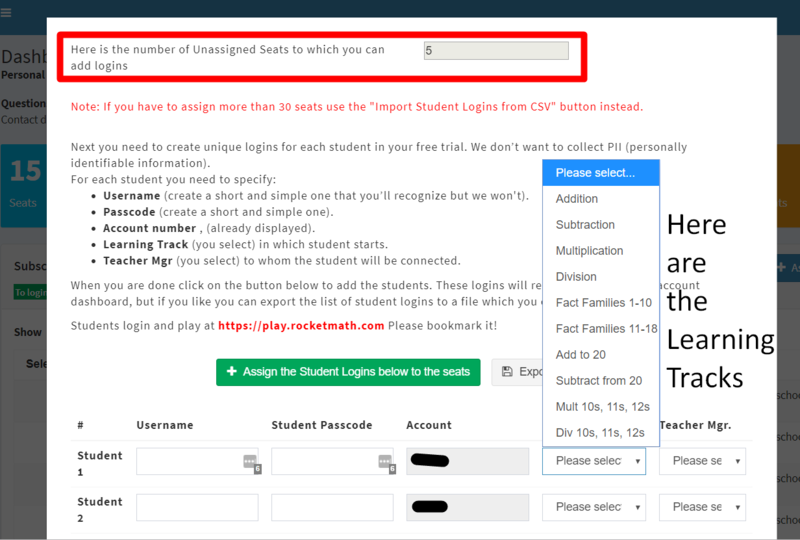 Next, you or your Teacher Managers will go on to assign student login information to your “unassigned” seats so the students can login and play. First–Have you set up Teacher Mgrs? If you have more than one classroom of students, you will need to assign them to Teacher Mgrs. So you first need to Add Teacher Mgrs to the account. 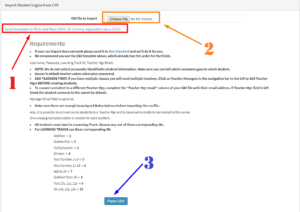 Please read and follow the directions about How to Add More Teacher Mgrs to your account BEFORE you start to assign login information to students. Next: Assign Logins to many seats at once–4 steps. The orange box on your dashboard shows the number “Unassigned Seats” you have that can be assigned to students. looks like this picture to the left. See the blank Excel template to the right. Username. You’ll make up a username and a passcode for each student. We do not want to collect personally identifiable information on your students, so we don’t want their actual names. But make sure you know who goes to which username. Only you need to know, we don’t. *** See note below. Passcode. You’ll make up a passcode for each student. Learn Track code. Enter the code number, and only the code number, for the Learning Track they will start in. You can change it at any time. Click here for the directions page about Learning Tracks if you need help deciding. Teacher Mgr email. You are the default Teacher Mgr so if you leave this blank the students will all be assigned to you the account owner. Add the Teacher Mgr’s email address only if you wish to connect the student to a Teacher Mgr other than yourself. CAREFUL! It needs to be a Teacher Mgr that you have already set up in your account. Class name. This is a future plan for schools in which teachers have multiple classes. Leave it blank for now. Once you have completed the file, use SAVE AS to save it to your computer as a CSV file (it’s an excel file now, so you have to choose Save As and find CSV (Comma delimited) in the list). See what that looks like to the right. 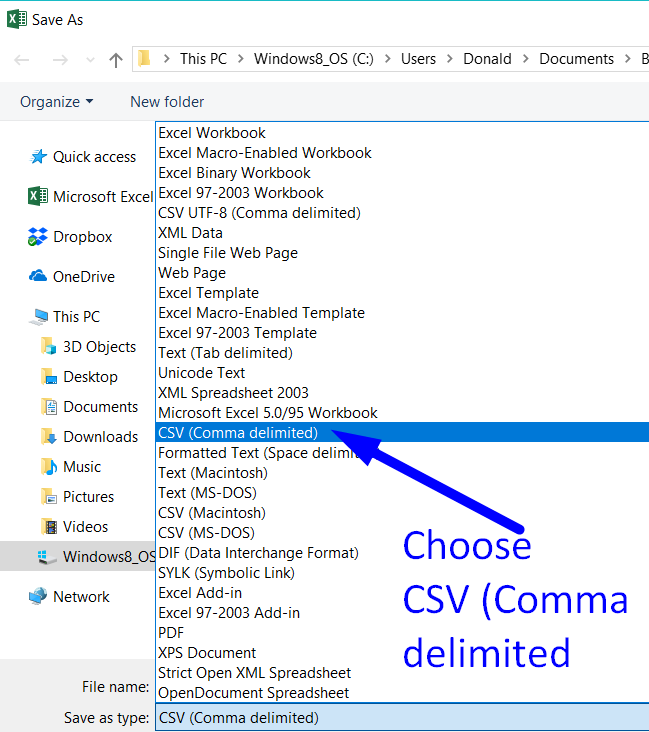 If you don’t choose SAVE AS and select CSV (Comma delimited) then your file won’t import. Be sure to save the file somewhere you can find again, because you’ll need it again in the next step. Browse to the CSV file you just saved on your computer and select it. Now the name of the file should show up in this box. After you hit “Parse CSV” you’ll see a list of your students. Scroll to the bottom and hit the blue button that says “Import Students.” Then they will be set up in the system. If something goes wrong, use the red button on your Dashboard that says “Delete ALL students!” It is extreme. Do NOT do this if some classes have started working! Delete All Students will clear out all of your student data, allowing you to start over and re-import. ***BE KIND. Your students have to enter the username, passcode and Account number every time they login to play. So be kind and make these short, easy to remember, and easy to type in. Initials or nickname for username, a short word or 4 digits for a passcode. Upload the blank template onto your computer. 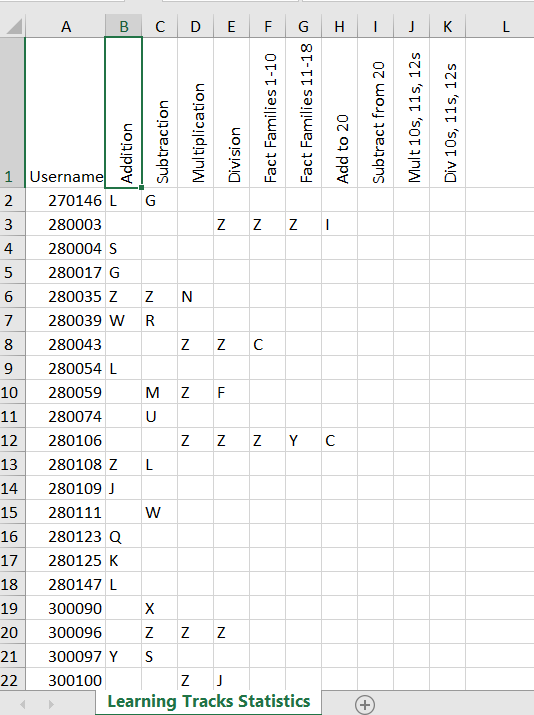 Add a column at the left of the columns that are on the template and label it student names. Fill out names and usernames and passcodes and Learn Track codes and Teacher Mgr email addresses. Save a copy of this “with names” file on your computer for use in the school to share with teachers, etc. Use that “without names” copy to import into our system. Now you have both. If you just have your family it’s easy, just tell your kids what their username, passcode and Customer name/number are. Maybe write it down on a piece of paper? They have to enter this information every time they want to play. You can go back and edit that information if you decide you chose something too long to type or too hard to remember. What if you have a class full of students? 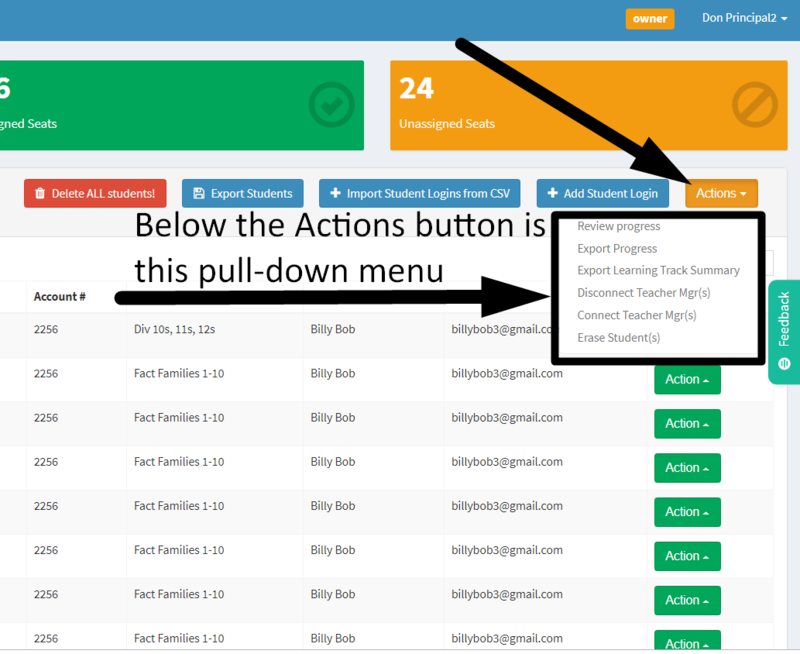 In your dashboard there is a blue button that says, Export Students. (I know you’re wondering who would pay for them sight unseen.) It is outlined in black in this picture with an arrow pointing toward it. 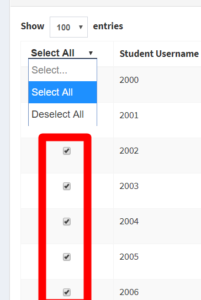 Clicking on this button does not send your students away, instead it creates an excel file with the login information of all your students listed. So you can walk around and give them the information. I promise I will figure out a way that it will print that info out onto little Avery labels that you can paste onto something and give to them. Just not this month. Share the login information with parents! You want your students to play at home as well as at school! The best way to do that is to let the parents know how their students should login. Complete each student’s login information so they can take it home. Have them take it home to share with their parents. Note the green feedback button for when there are technical difficulties. A five to ten minute session each evening at home can make a huge difference in progress! You can also find a link to this “Parent Letter” on your dashboard in the left hand black navigation bar. At first, it may seem like the way Rocket Math presents the same simple facts over and over, is so easy, it must be a waste of time. In the Worksheet Program, students practice with a partner. In the Online Game the student practices with the computer. 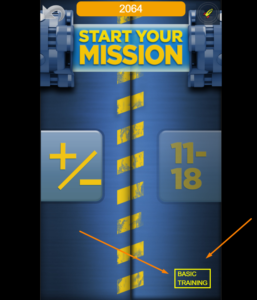 In both versions of Rocket Math the students follow the same careful sequence and slowly, but successfully, build mastery of all of the facts in an operation. It’s hard work and takes a while, but we try to make it fun along the way. It will work for everybody, but not everybody is willing to do the work. At least, now you understand how Rocket Math is designed so it can teach mastery of math facts. Bookmark this site or make a button for it. PLEASE in self-defense teach your students how to bookmark the site. Otherwise they’re going to ask you to enter the url over and over again. The first thing they will see will be this “enter’ screen. 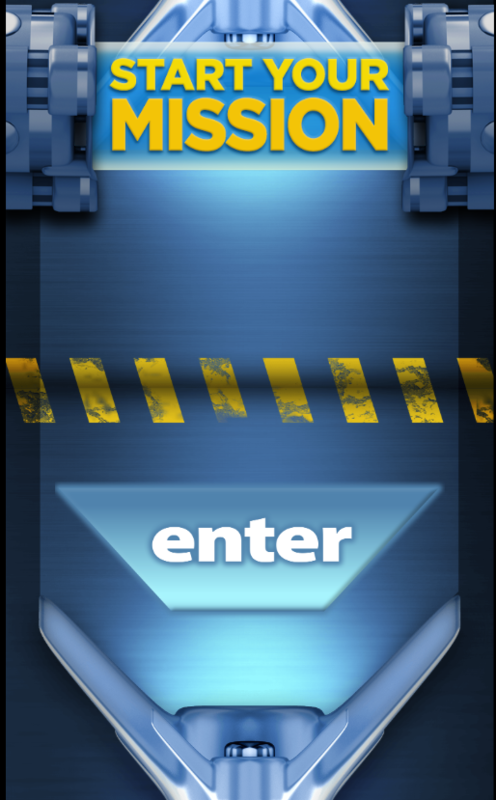 Students just hit the “enter!” button and it sort of wakes up the game, so it knows to ask for the login information. Next the login screen comes up. 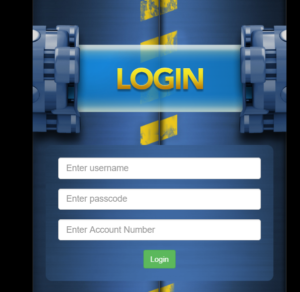 Students must enter their username, passcode, and Account Number to login and play. (Some early adopting customers may have a name there–that’s OK.) Students have to enter all three pieces of information right, so they may need some help in the beginning. The owner can also edit student’s usernames and passcodes in your dashboard on the row with their info. I wouldn’t throw in the towel immediately, but there comes a point where it’s smarter to make things easier. You can also change their Learning Track from the Actions button at the end of that same row. Ask students to log out after each session. Students should logout when they are done playing. THIS IS ESSENTIAL IF YOU WANT ANOTHER STUDENT TO BE ABLE TO USE THAT DEVICE! On every screen in the upper left hand corner is the curvy arrow. 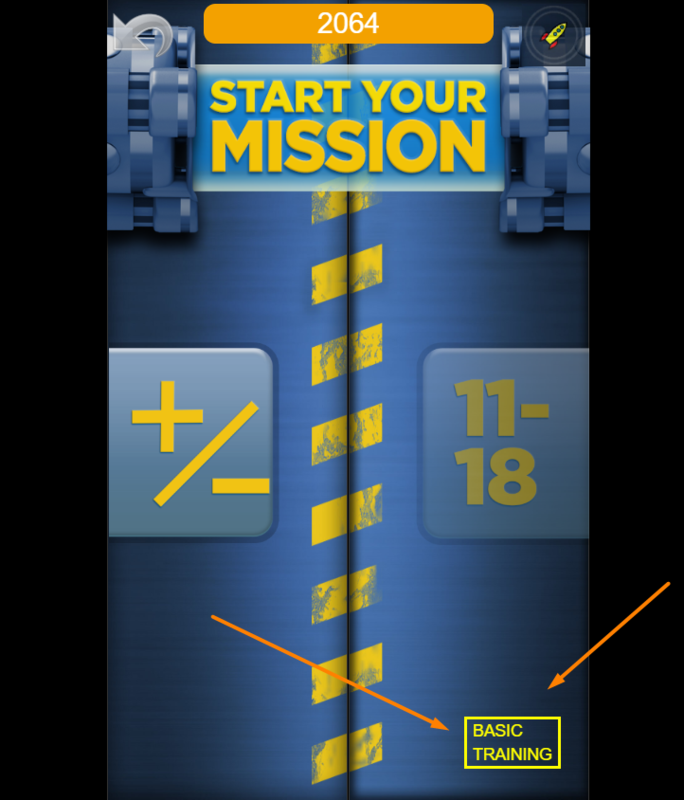 Clicking on that will take you back to the Start Your Mission page. Clicking it again will take the students to the Logout page, which just has a white logout box. Clicking on that box logs them out. It is helpful to the playing of the game if they logout each time they are done. Also, they have to be logged out for you to change their Learning Track. Encourage students to watch the BASIC TRAINING video. By the way, here’s a link to the BASIC TRAINING-video I made for them. (It does not go to YouTube!) Encourage your students to view it–maybe when they have to take a battery recharge. It is 9 minutes long. You can see the BASIC TRAINING link in the bottom right corner of the Start page, before or after they play. In the video, Dr. Don speaks from Mission Control with encouragement and valuable tips on to how to play the game. Any problems with the game? Use the Feedback button. Finally, there is this green Feedback button to the far right of the playing screen. Students can use that to report a problem, when the game doesn’t go right. They can click on the screen on the part that isn’t working and it will send the information directly to the developers. It will also tell the developers what kind of device and which browser the student was using, in case that information is found to be relevant. Please encourage students to use that so we can get specific information about any glitches in the game. When a student finishes a Learning Track you’ll need to switch that student to another one. First, make sure the student has logged out of his or her account before you make the change. If they are still logged in the learning track change will NOT work! 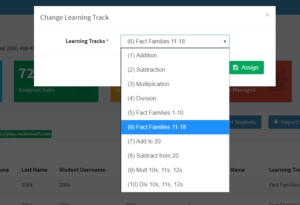 Next you will get this popup for “Change Learning Track” which has a pull down menu of all ten Learning Tracks. Choose the one you want and then click on the green “Assign” button. Did I say to make sure the student logged out? Now, have the student log back into their account, to be sure it has been changed. If they are stuck at the “Level Done” screen have them log out again. Then re-assign them to the learning track you want. Then have them login again. If the student is still stuck, use the feedback button. Students are going to ask you to change their Learning Track, just as soon as it gets a little hard. 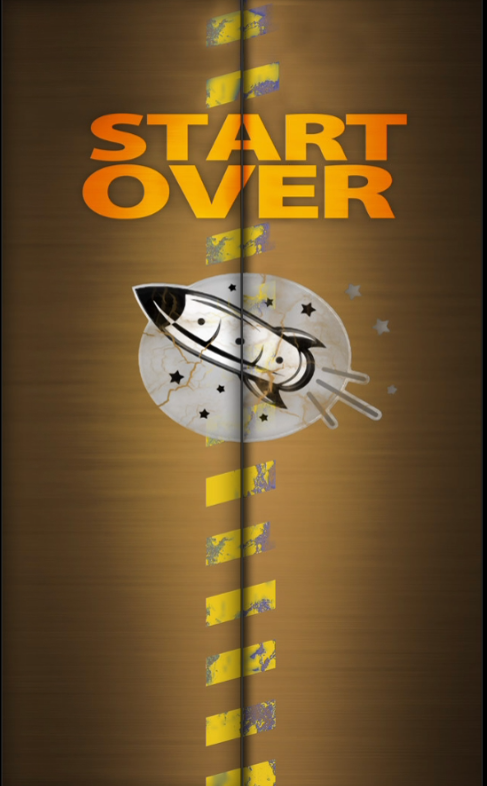 They may have to start over a couple of times and if they lack much perseverance, they will want to quit. But they only learn the facts if they stick with it. If they skip around they are going to be wasting their time. If you assigned it, then they ought to be learning those facts. Here is a link to a “Toughness Certificate” you can use for students who have a hard time with Rocket Math and need to be encouraged to stay the course. Starting all over. You can also tell students (and this is a fact) that if they leave a Learning Track, when they come back, they start over at Set A. So they lose all they have gained by quitting before they reach Level Z. I believe that teaching the lesson that hard work and perseverance helps you succeed, especially when you are getting discouraged, is the best thing we can do for young people. Encourage them to stay the course. Then celebrate mightily when they succeed! Woo-hoo! They are learning a great life lesson. You can change the teacher for a student or a set of students. (1) First select the student or students you want to change or connect to someone new. 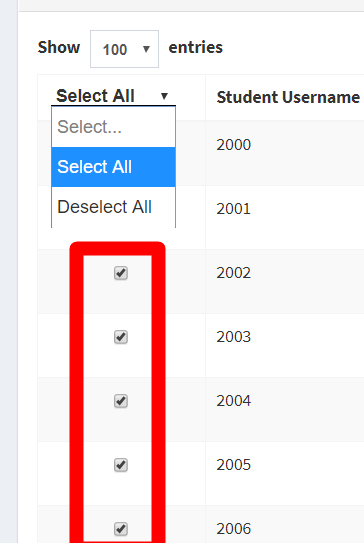 By default, all the students are selected, so in the lefthand most column you’ll have to un-check the ones you don’t want to change. Or you can go to the top of that column and pull down to “Deselect All” and it will un-check everyone and you can check the ones you want to disconnect and connect to someone new. BE CAREFUL. Whatever actions you choose will happen to ALL the selected students in a second, so be careful. (2) Pull-down menu on Orange Actions button at the upper right. Go to the same orange Actions button in the upper right hand of the owner’s dashboard. Pull down and click on “Disconnect Teacher.” Now the student is sort of a “free agent” if you will. Make sure of who is “selected” before this next step. To connect the students to a new teacher go to the orange Actions button, pull down and you’ll see “Connect Teacher.” A pop-up will give you the options of Teacher Mgrs in the account. You have to pull down to see who all is available, but then select one and hit the green button to make it happen. 6.B) Why the 30 minute battery-recharge after five minutes of play? 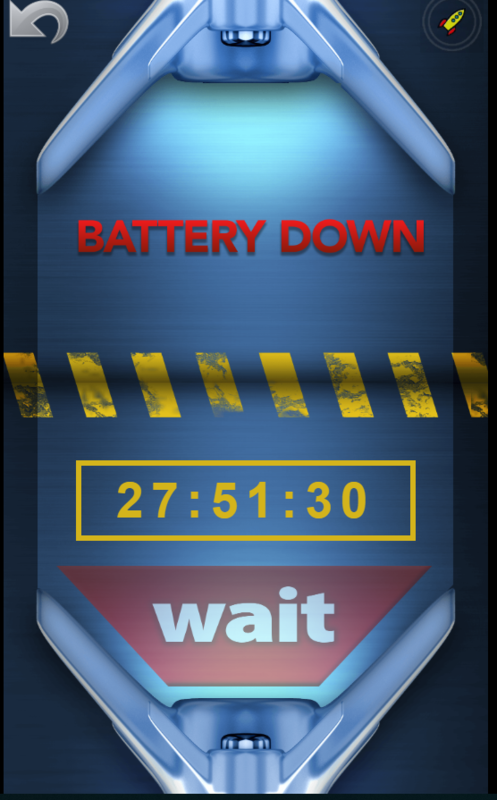 This 30-minute “Battery Down” break is a feature, not a bug. Slamming through these facts at the rate of 3 seconds apiece (or less as they go faster) is very INTENSE. Students will do this game for an hour at a time if you let them, but only for a couple of days, and then they will just wear out. They just won’t want to do it anymore. We don’t want them to lose their enthusiasm, so……. After five minutes of play, up comes this screen (to the right). 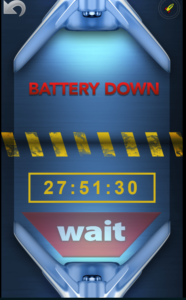 We say the battery is down and will need at least 30 minutes to “recharge.” The countdown timer shows the amount of time left until the student’s break is over. The student has to take at least a 30 minute break. We want them to do a little practice a couple of times a day, but spaced out over a month or two. The longer this is spaced out the longer they will retain the information. And they need to know these facts for a lifetime! So a little bit each day is far better than sitting down for long periods of time until they are sick of it. Yes, they may complain that they have to stop, but that ensures that they will want to come back again later. That’s how they win! And, of c ourse, find ways to have them share their success. Here’s a Rocket Chart you can use if you like.